Are you considering the different types of restorative dental procedures available? Does a dental bridge seem to make the most sense financially? If you have a missing tooth and want to restore that gap in your mouth, it is vital to look at the differences between a dental bridge and a tooth implant. They are a 3-tooth solution to a 1-tooth problem – the adjacent teeth must be prepped and crowned to hold the replacement (floating) tooth. It is hard to properly clean the small areas under the bridge. A dental bridge does not protect against bone recession at the extraction site. Why does a tooth implant have advantages over a dental bridge? It is a 1-tooth solution to a 1-tooth problem. Will lessen the risk of bone recession (as compared to a bridge) because it replaces the tooth root. 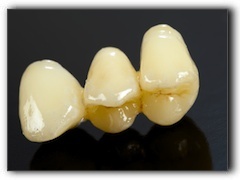 It is usually not as difficult to clean as a dental bridge – lower risk of decay. Dental implants can support a denture or partial denture. If you need to replace a tooth, talk to your Ft. Worth dentist about dental financing options.If you opt for a dental implant, it will probably be less expensive in the long run. If you want to learn more about dental implants, I invite you to call The Parkway Dentist at 817-769-2763. I am Dr. Justin Cook, and I am zealous about restoring smiles for my Benbrook area patients with beautiful permanent restorations. Call today to schedule a dental implant consultation at my Ft. Worth office.